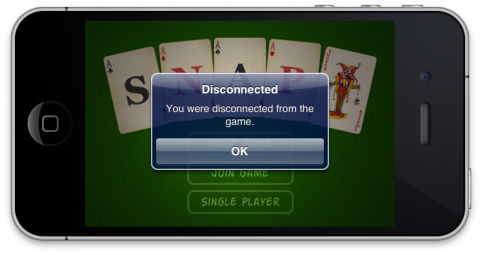 Create a networked multiplayer card game! You also created a game server that broadcasts the “Snap!” service and a client that detects the server, but the only evidence of this so far is some NSLog-lines in the Xcode debug output pane. Now in Part 2, you’ll show the available servers and connected clients on the screen properly, and finish up the matchmaking. Ante up! The MatchmakingClient class has an _availableServers variable, an NSMutableArray, that is supposed to hold the list of servers that this client has detected on the network. You’ll add the peer ID of the server to this array whenever GKSession detects a new server. // The client has discovered a new server. // The client sees that a server goes away. The newly discovered server is identified by the peerID parameter. This is a string that contains a number, such as @”663723729.” This number is only important in that it identifies the server. The third parameter is “state,” and it tells you what is going on with that peer. Currently you deal only with the states GKPeerStateAvailable and GKPeerStateUnavailable. As you can tell from their names, these states indicate that a new server has been discovered, or that a server went away (possibly because that user exited the app or he wandered out of range). Depending on the circumstance, you either add the server’s peer ID to the list of _availableServers, or you remove it from that list. It works! 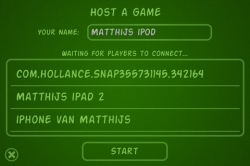 The client shows the name of the server (in the screenshot above, I used my iPod as the server). Try the following: exit the app on the device that acts as the server. The client should now remove the name of that server from its table view. If you have enough devices, try the app with more than one device acting as a server. The client should find all the servers and show their names in the table view. Note: It may take a few seconds for the client to recognize that a server has appeared or disappeared, so don’t panic if the table view doesn’t immediately reload! The next thing to do is make the client connect to the server. So far, your app hasn’t made any connections – the client has shown to the user what servers are available, but the server doesn’t know anything about the client yet. Only after you tap the name of an available server will the client announce itself to that server. So the MatchmakingClient can do two different things. At first, it’s looking for servers to join. When you pick a server, it will try to connect to that server. At that point, assuming it connects successfully and stays connected, the MatchmakingClient is no longer interested in any of the other servers. So there’s no reason for it to keep looking for new servers or update its _availableServers list (nor to tell its delegate about this [about what?]). That’s four states the MatchmakingClient can occupy. It starts out in the “idle” state, where it just sits there, doing nothing. When you call startSearchingForServersWithSessionID:, it moves to the “Searching for Servers” state. That’s the code you’ve written so far. When the user decides to connect to a particular server, the client first goes into the “connecting” state, where it attempts to connect to the server, and finally to “connected” when the connection is successfully established. If at any time in these last two states the server drops the connection (or disappears altogether), you move the client back to the idle state. The MatchmakingClient will behave differently depending on which state it’s occupying. In the “searching for servers” state, it will add to or remove servers from its _availableServers list, but in the “connecting” or “connected” states, it won’t. Using such a diagram to describe the possible states of your objects, you can make it immediately clear what your objects are supposed to do in different circumstances. You’ll be using state diagrams a few more times in this tutorial, including when managing the game state (which is a bit more complex than what you have here). You only care about the GKPeerStateAvailable and GKPeerStateUnavailable messages if you’re in the ClientStateSearchingForServers state. Note that there are two types of state here: the state of the peer, as reported by the delegate method, and the state of the MatchmakingClient. I named the latter _clientState, as not to confuse things too much. You can only call this method from the “searching for servers” state. If you don’t, then the application will exit with an assertion failure. That’s just a bit of defensive programming to make sure the state machine works. You change the state to “connecting,” save the server’s peer ID in a new instance variable named _serverPeerID, and tell the GKSession object to connect this client to that peerID. For the timeout value – how long the session waits before it disconnects a peer that doesn’t respond – you use the default disconnect timeout from GKSession. This should be quite straightforward. First you determine the server’s peer ID (by looking at indexPath.row), and then call the new method to make the connection. 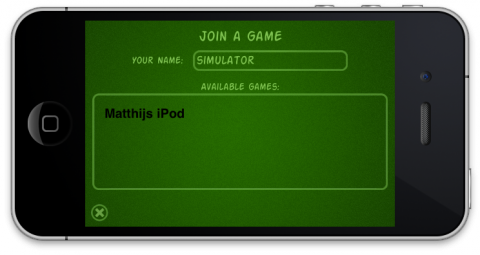 Note that you also add the UIView from the “waitView” outlet to the screen, in order to cover up the table view and the other controls. Recall from earlier that the waitView is a second top-level view in the nib that you’ll use as a progress indicator. The MatchmakingClient has moved into the “connecting” state and is waiting for confirmation from the server. You don’t want the user to try and join any other servers at this point, so you display this temporary waiting screen. These are notifications from GKSession telling the server that the client (who apparently has ID “1310979776” in this example) is attempting to connect. In the next section, you’ll make MatchmakingServer a bit smarter so that it will accept those connections and display the connected clients on the screen. Now you have a client that will attempt to make a connection, but on the server side, you still have to accept that connection before everything is hunky-dory. That happens in the MatchmakingServer. Unlike the client, the server only has three states. // A new client has connected to the server. // A client has disconnected from the server. This time you’re interested in the GKPeerStateConnected and GKPeerStateDisconnected states. The logic is very similar to what you’ve seen in the client: you simply add the peer ID to an array and notify the delegate. Whew, that was a lot of typing! Now you can run the app again. Restart it on the device that will function as the server (it’s OK to restart the app on the client device too, but you haven’t changed anything in the client code, so it’s not really necessary). Now when you tap the name of a server on the client device, the name of that client device should appear in the table view on the server. Try it out. Except that… nothing happens (got ya!). As I said before, at this point the client is still trying to make a connection to the server, but the connection isn’t fully established until the server accepts it. GKSession has another delegate method for that, named session:didReceiveConnectionRequestFromPeer:. To accept the incoming connection, the server has to implement this method and call acceptConnectionFromPeer:error: on the session object. First you check if the server's state is "accepting connections." If not, then you obviously don't want to accept any new connections, so you call denyConnectionFromPeer:. You also do that when you already have the maximum number of connected clients, as specified by the maxClients property, which for Snap! is set to 3. If everything checks out, you'll call acceptConnectionFromPeer:error:. After that, the other GKSession delegate method will be called and the new client will show up in the table view. Restart the app on the server device and try again. State 2 corresponds to GKPeerStateConnected. Congrats! You have established a connection between the server and the client. Both devices can now send messages to each other through the GKSession object (something that you will do a lot of shortly). Note: Even though you can type another name in the text field at the top of the screen, what appears in the table views are always the names of the devices themselves (in other words, the placeholder text from the "Your Name:" text field). Here's something to remember when it comes to writing networked code: it is extremely unpredictable. At any given moment, the connection may be broken and you need to gracefully handle that on either side, both client and server. Here's how to handle the client side. Say the client is waiting to be connected, or that the connection has just been established, and the server suddenly goes away. What you do next depends on your app, but in the case of Snap! 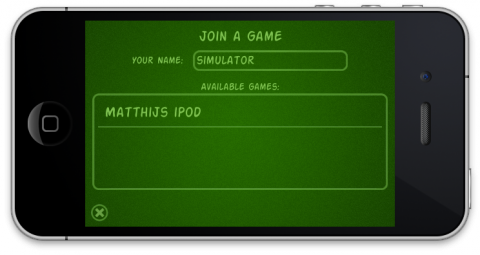 you'll return the player to the main screen. // You're now connected to the server. // You're now no longer connected to the server. Here you return the MatchmakingClient to the "idle" state, and clean up and destroy the GKSession object. You also call a new delegate method to let the JoinViewController know that the client is now disconnected. There's nothing special here. You simply call disconnectFromServer whenever this happens. Note that this delegate method will also be called when a client tries to connect and the server explicitly calls denyConnectionFromPeer:, such as when there are already three clients active. That's pretty simple, except maybe for the last line. Because you want to return the player to the main screen, the JoinViewController has to let the MainViewController know that the player got disconnected. 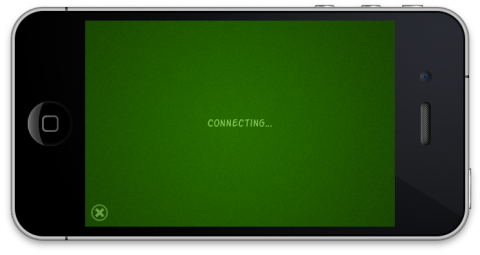 There are different reasons why a player can get disconnected, and you need to let the main screen know why, so it can display an alert view if necessary. For example, if the player quit the game on purpose, then no alert should be shown, because the player already knows why he got disconnected – after all, he pressed the exit button himself. But in case of a networking error, it's good to show some kind of explanation. That means there are two more things to do here: add this new delegate method to JoinViewControllerDelegate, and add the _quitReason variable. Those are the four reasons that Snap! recognizes. The JoinViewController needs an instance variable that stores the reason for quitting. You will set this variable to the proper value in a few different places, and then when the client truly disconnects, you'll pass it along to your own delegate. The default value for _quitReason is "connection dropped." Unless the user quits for another reason – for example, by pressing the exit button – a server disconnect will be regarded as a networking problem, rather than something that happened intentionally. First you set the quit reason to "user quit," and then you tell the client to disconnect. Now when you receive the matchmakingClient:didDisconnectFromServer: callback message, it will tell the MainViewController that the reason is "user quit," and no alert message is shown. Run the app again, make a connection, and then press the exit button on the client. In the server debug output you should see that the client disconnected. The client's name should also disappear from the table view. Note: If you restore the server app after putting it into the background with the Home button, then you need to go back to the main screen and press Host Game again. The GKSession object is no longer valid after the app has been suspended. The actual error is reported in an NSError object, and if that is a GKSessionCannotEnableError, then the network simply isn't available. In that case, you tell your delegate (with a new method) and disconnect from the server. That was pretty simple: you just set the quit reason to "no network." Because the MatchmakingClient calls disconnectFromServer, the JoinViewController also gets a didDisconnectFromServer message and tells the MainViewController about it. All you have to do now is make MainViewController handle this new quit reason. To test this code, run the app on a device in Airplane Mode (with Wi-Fi and Bluetooth turned off). Note: On my devices, I have to go into the Join Game screen (where nothing happens), press the exit button to go back to main, and then go into the Join Game screen again. I'm not sure why Game Kit doesn't recognize this problem on the first try. Maybe a more robust solution would use the Reachability API to check for Bluetooth and Wi-Fi availability. For this "no network" error, you don't actually leave the Join Game screen, even though you stop the session and any networking activity. I think that jumping back to the main screen would be too disorienting for the user. Note: The code that displays the alert views – and in fact any code that displays text in this app – uses the NSLocalizedString() macro for internationalization. Even if your apps only do English at first, it's smart to prepare your code for localizations that you may do later. For more information, see this tutorial. There is one more situation you need to handle on the client side. In my testing, I found that sometimes a server becomes unavailable while a client is trying to connect to it. In that case, the client receives a callback with state GKPeerStateUnavailable. If you didn't handle this situation, then eventually the client would timeout, and the user would get some kind of error message. But you can code the app to check for this type of disconnect, too. // Is this the server we're currently trying to connect with? On the server, dealing with disconnects and errors is very similar. You already have the code in place to deal with clients who disconnect, so that's easy. No big surprises here. You call two new delegate methods, matchmakingServerNoNetwork: and matchmakingServerSessionDidEnd:. Add these to your protocol in MatchmakingServer.h, then implement them in the HostViewController. 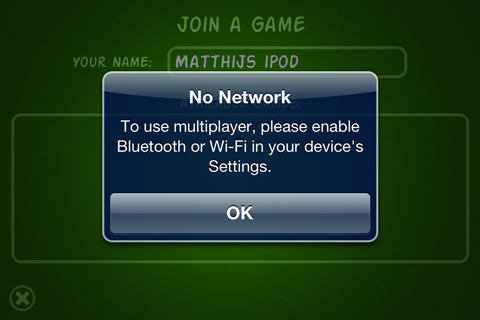 Run the app on the device in Airplane Mode and try to host a game. You should get the "no network" error. (If you don't get it the first time, exit to the main menu and tap the Host Game button again.) Go to the Settings app, turn off Airplane Mode, and switch back to Snap! again. Tap the Host Game button once more, and now clients should be able to find the server. The cool thing is, you can drop the MatchmakingServer and MatchmakingClient classes into other projects and get all this functionality for free! Because these classes are designed to be independent of any view controllers, they are easy to reuse in other projects. Get ready to tackle Part 3, where you'll get the client and server sending messages across the network to each other!